There’s a chain reaction happening in New Mexico. County by county, local officials are showing support for worker freedom by passing right-to-work ordinances. First it was Sandoval County, which passed right-to-work in January. Now, bordering counties of San Juan and McKinley are considering it, as is near-by Torrance County. Second was Otero County, which passed right-to-work in April. The county’s west side is bordered by Sierra and Doña Ana — both counties have introduced right-to-work measures. Lincoln County, Otero County’s neighbor to the north, passed it May 15, becoming the third. 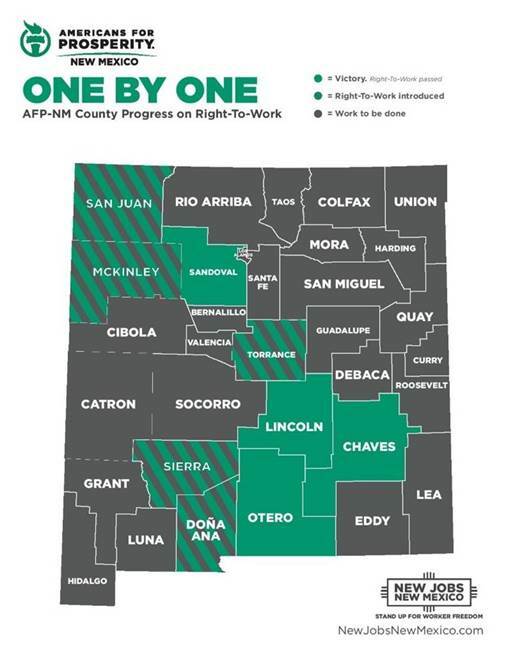 Now Chaves County, which borders both Lincoln and Otero counties, has become the fourth county in New Mexico to pass right-to-work. The Board of Commissioners voted unanimously May 21. As shown by the map below, counties are catching on to how important worker freedom is. The Americans for Prosperity – New Mexico team has no plans to stop its education efforts across the state. In New Mexico, too many workers are forced to pay union dues to keep their jobs. But AFP believes that everyone should be free to choose whether union representation is worth part of their hard-earned paycheck. Right-to-work gives people that choice. Right-to-work may sound scary to unions, as it rightly transfers some of its powers to the workers. But worker freedom benefits everyone. Economic outlook and employment are higher in states where workers are free from mandatory union membership. Those states also enjoy more job growth. And because right-to-work laws force unions to serve their members to earn their dues, overall union membership increased in right-to-work states between 2005 and 2015. Although the map above shows a great start, the goal is to pass right-to-work in counties across the state. There’s plenty more work to be done! 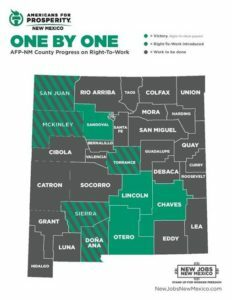 Visit NewJobsNewMexico.com to learn more about right-to-work and how you can get involved in supporting worker freedom!